Robin has spent many years restoring neglected country houses making them into apartments, bringing them back into use, suitable for modern living. This required sourcing period architectural fixtures and fittings, this developed into specialising in restoring chimneypieces and gilt mirrors about 40 years ago. 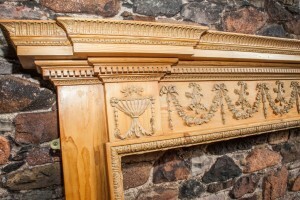 The earlier Georgian chimneypieces, were all carved wood which was very time consuming , as the demand increased, a composition called “gesso” was developed. The gesso could be moulded in to “a run”, the intricate decoration could be reproduced quickly. A combination of carved wood and gesso was very popular. The variety of the decoration is incredible; flowers, leaves, fruit, birds, animals and tabloids of children dancing, to name a few. A Victorian chimneypieces is bold, with a wider shelf, it has presence.